Barnes & Noble has teamed up with Google to offer same-day shipping in Manhattan, San Francisco and parts of Los Angeles to compete with Amazon. Couriers are a common sight in the teeming streets of Manhattan, but they don't normally hustle books. That changes today. Barnes & Noble has teamed up with Google to compete with Amazon (AMZN) on same-day delivery. Now customers can have Barnes & Noble books delivered via Google Shopping Express in three metropolitan areas: Manhattan, west Los Angeles and the San Francisco peninsula. 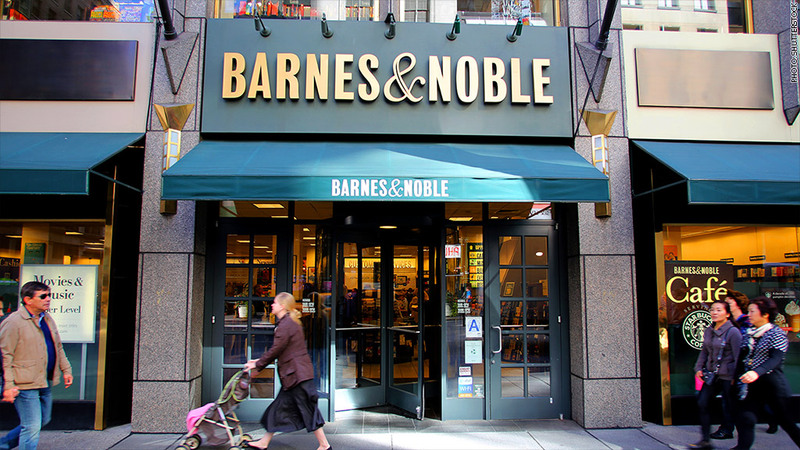 In a sense, Barnes & Noble (BKS) will turn its book stores, including its sprawling flagship shop in Manhattan's Union Square, into warehouses as well as brick-and-mortar retail spaces. "The way the program is set up, they're using our local stores as the hub for this," said Jaime Carey, chief merchandising officer for Barnes & Noble. He said there are Google employees in the Barnes & Noble stores who pull the books from the shelves when the orders come in and pass them off to Google couriers who deliver them to the customers. Barnes & Noble shares jumped nearly 4% on the news. Google (GOOG) did not immediately respond to CNNMoney's request for comment. Customers can tap into three different daily delivery windows, from 9 a.m. to 1 p.m., from 1 p.m. to 5 p.m., and from 6 p.m. to 10 p.m.
Barnes & Noble already offers its own same-day delivery in Manhattan, but this will be the first time the service is offered in Los Angeles and San Francisco. He said that even where same-delivery service was already available, the partnership with Google allows Barnes & Noble to expand into a new pool of customer online. "For us, it's fantastic that we can bring new customers to those local stores," he said. Google Shopping Express already has partnerships with Target (TGT), Walgreens (WAG), Costco (COST), Staples (SPLS), Toys 'R' Us (and Babies 'R' Us,) L'Occitane and Fairway Market. The book industry has been struggling for a long time. But Barnes & Noble, the last big bookstore chain, has shown signs of a turnaround this year, with growing sales.